EXCLUSIVE: Knickers, bras and pants! Brit’ Traveller reveals ALL! | "MASTERS"
Mark and Sarah… Travelling, Exploring & Roaming Sedulously! EXCLUSIVE: Knickers, bras and pants! Brit’ Traveller reveals ALL! Posted on September 10, 2015 by Mark and Sarah - MASTERS! SARAH: Having left the emotional “stuff” to Mark my brief for this trip has been to focus on the more practical elements… As Mark has been writing his blogs, my role has been to ensure the security and well-being of all our worldly possessions, which essentially entails packing, unpacking and washing… So, I thought it worth sharing the all-important issue of how to wash clothes whilst you are constantly travelling on the road. In fairness, there is not a lot to wash. In my “wardrobe” I have, six pairs of knickers, three bras, five t shirts, three shirts, two pairs of trousers, two sweat shirts, three pairs of shorts, one pair of jeans (a very good last minute decision) and two dresses. I managed to wear my newly purchased Montane trousers for seven days in a row and nobody seemed to notice, because here in India nobody seems to care what you wear or what you look like. At least we have clothes to wear! 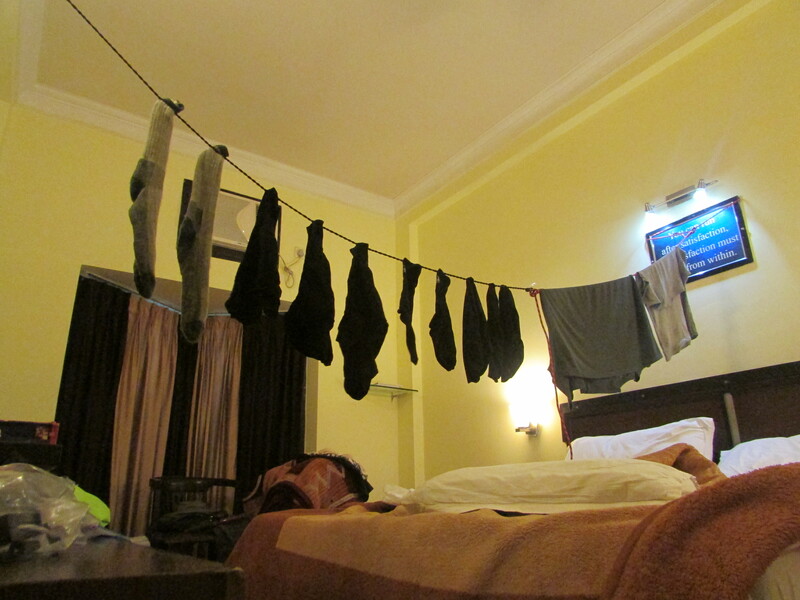 By the time we reached Amritsar, we decided to wash some smalls and some t shirts in the basin and hang them to dry on a washing line we brought with us, which when stretched, is about 3m in length. At both ends are two hooks and two suction pads which work fine if there is not too much weight. Improvisation is the order of the day as the photos show. After about a day, the clothes are dry – job done. The bras hit the fan – great drier, but only on slow spin speed! Mark meanwhile thought he would use the Hotel Hong Kong Inn’s (Amritsar) laundry service for his trousers, a bargain at just 30 Indian Rupees (30 pence). They came back cleanish, not my quality clean, but good enough. At Shimla, the former home of the British Raj in the 1920s, more washing and for the first time in 27 years of married life Mark actually did some hand washing. Not a pretty sight I have to say. Mr B in the shower sporting a pair of black pants, scrubbing away in a bucket, bras, knickers, T shirts and socks. Sadly a photo I took was censored by the Blog Police. Must say I have not been at all impressed with Cotswold’s bio degradeable washing flakes, which cost a rather expensive £2.50 for just 50 flakes. 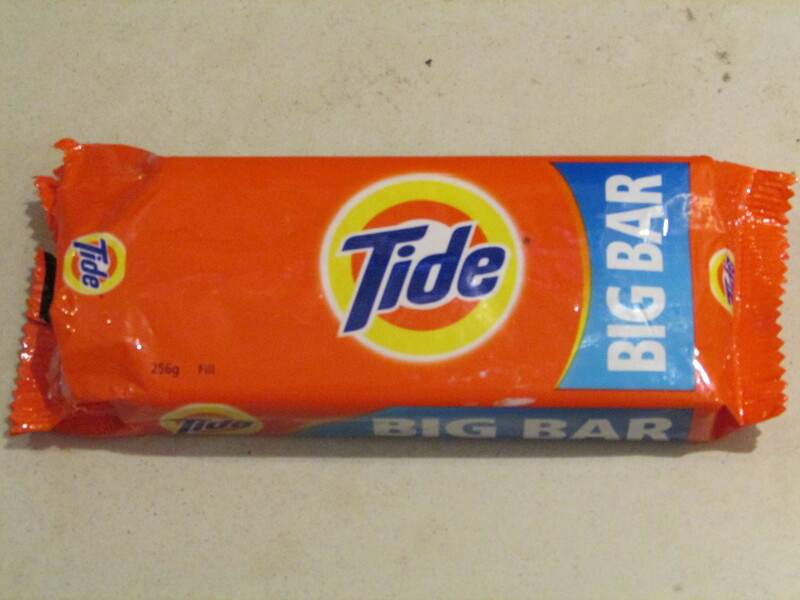 So today rushed out and invested 20 Rupees on a massive soap bar which has washed the trousers much better I’ve found and the soap bar will probably last us until we get to Malaysia in three months’ time. I am going to explore the possibilities of full laundry “outsourcing” when we get to Goa in a weeks time as rumour has it the whole lot can be done for a couple of quid which sounds a bargain. After all, I think I deserve a bit of sun and relaxation after all this travelling. Any laundry top tips welcomed. Mark and Sarah - MASTERS!